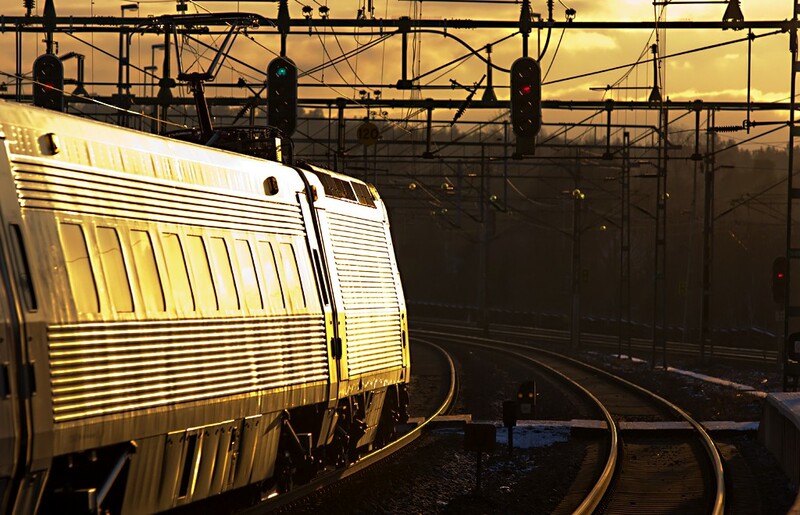 When browsing travel forums there are often lots of questions about trains in Sweden. I had the opportunity to travel First Class on the train between Stockholm and Malmö lately and here is my report. Trains in Sweden in General. The high speed trains are very comfortable in both First and Second Class and highly recommended. I have been flying a lot between Malmö Sturup (IATA: MMX) or Copenhagen (IATA: CPH) to Stockholm but have come to the conclusion that I do enjoy the train because it is less stressful. You board the train in the city center and get off the train in the city center. When flying you have to get to the airport by bus, train, taxi or car. Then you have to check in, wait in line to drop your bag, wait in line for security and then run through the airport. Having run to your gate, you wait some more there. Repeat in reverse on arrival. Yes, you will shave an hour off the total travel time when flying but you arrive rested when taking the train. Facilities on Board Swedish High Speed Trains. The Swedish high speed trains are designed by Kalmar Verkstad and ABB with a purpose to run high speed trains on existing rails. These trains were initially called X2000 and manufactured between 1989 and 1998. Even though this type of train has been running since the end of the 1980´s in Sweden it still feels fresh. Especially compared to a Boeing 747 from the same era. The seats and pitch are slightly bigger in First Class but it is extremely hard to tell the difference. I am 190 cm tall and fit well in a Second Class seat. Design and layout in First Class and Second Class is very similar and it is hard to tell the difference by just looking at the interior. 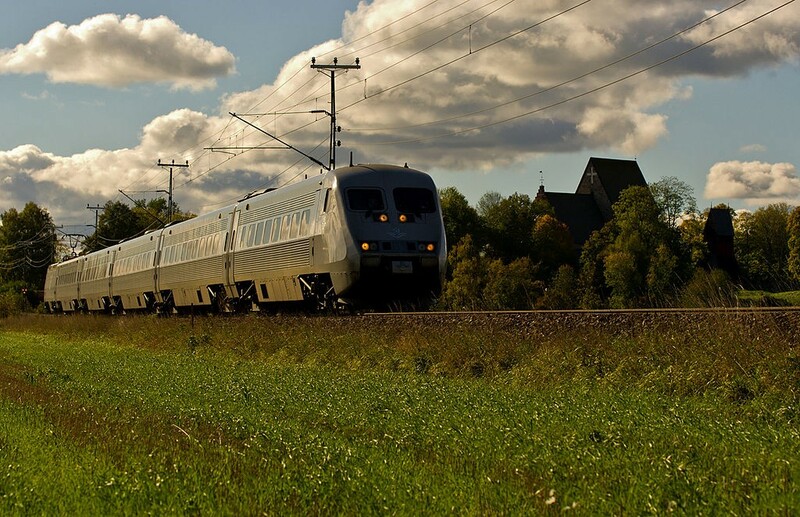 SJ2000 passing through Swedish countryside. 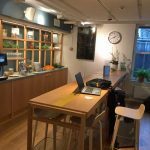 In First you will get free coffee, tea, water and fruit and snacks. In Second you have to buy it yourself in the onboard Bistro. In addition to hot and cold drinks you will be able to purchase ready-made dishes to microwave in the Bistro´s microwave ovens, wine, beer and snacks. The food offered on board and is continously improving. If you asked med 2 years ago, I would say it is enough to keep you alive. Now it compares with any better fast food restaurant. You may also pre-book your meal when buying your ticket, which is wise. By pre-booking you will rest assured that your choice always is available. 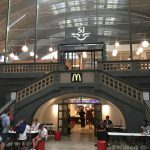 There are plenty of fast food outlets on most train stations and you can bring food onboard the train. Wi-Fi on board SJ High Speed Trains in Sweden. All seats have tray tables or regular tables which is a great spot to place your laptop when enjoying the free Wi-Fi on board. Wi-Fi is free in both First and Second but data is limited for each trip, depending on duration. On a trip Stockholm – Malmö (which is close to Copenhagen and lasts for a little more than 4 hours) I get 200MB which is sufficient for regular surfing, emailing but not enough to stream movies. There are no means to purchase additional data on board. I have only had positive experiences with the Wi-Fi onboard Swedish trains. Even so, SJ is implementing the next generation of onboard internet on the trains. As a passenger you will notice speed improvements, increased stability and better Wi-Fi-coverage. 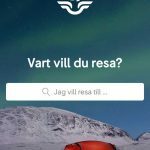 If you are travelling First Class (or holding a black loyalty card with SJ, Swedish State Railways) you will gain access to the First Class Lounge in Stockholm and Gothenburg. 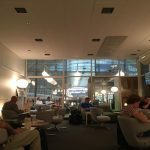 It is very nice to have somewhere quiet to relax before your trip in an otherwise bustling Central Station but should not be compared to any of the airlines’ First Class Lounges. You will be able to enjoy free Wi-Fi, hot and cold drinks. When I visited I was pleasantly surprised how nice the staff was, which was unheard of a couple of years back. Good job SJ! The entrance to SJ First Class Lounge at Stockholm Central Station. Inside the First Class Lounge at Stockholm Central Station. SJ First Class Lounge in Malmö. At the end of summer 2016 SJ inaugurated a First Class lounge at Malmö Central Station. It is brand new, fresh and has the same amenities as the lounges in Stockholm and Gothenburg. If you enter the station with your back against the canal (and the city) you will find it just behind SJ Ticket Counter to your right. Being early is a virtue in many ways but it does not pay off to be early on the departure platform. All trains are at the platform about 15 minutes before departure. If you arrive earlier you just will have to wait for your train to arrive on a crowded platform. This is NOT an encouragement to be late, just be on the platform 15 minutes before departure and you will be fine. If you are travelling during publich holidays like Halloween, Summer Holiday you can usually get a First Class ticket at the same price or cheaper than a Second Class ticket. If you are travelling with pets you will have to select a compartment for animals. Pet compartments are only available in second class on SJ Highspeed Trains. The pet is free of charge if it is riding on your lap or on the floor. If you want a seat for your pet you will have to purchase a youth ticket for it. SJ has launched a new website (sj.se) and app with lots of improvements. It not only looks a lot nicer and handles faster, it is easier to book your train ticket in the app. Tickets are more easily accessible in the updated app. SJ app showing remaining travel time. Very clever! Start page of the SJ App on IOS. 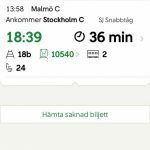 I have done more than 20 roundtrips between Stockholm and Malmö or Copenhagen the last year and have only suffered a substantial delay on 1 of the trips, which is not bad. All trips has been delayed 5 – 20 minutes which seems to be the norm. In Japan this would have been totally unacceptable but in Sweden we seem to accept it. I would NOT rely on Swedish trains for a tight connection without a really good travel insurance with cover for connection delays. This is in the northern part of the world and during winter a snow storm can easily delay everything quickly. Do I Recommend Trains in Sweden? Yes, as I said in the beginning: it is a very convenient and comfortable way of travelling. If you are going between 2 cities you are taken from city centre to city centre. You will also see a little bit more of Sweden than you would have if travelling by plane. I would love to hear from you in the comments below, on Twitter, Facebook or Google+ if you should have any questions or comments. If you are interested in Sweden, you might like my other articles about Sweden. This article has been edited 2016-12-29 in order to provide accurate information. Going to follow this blog! Thanks for the compliment and for taking the time to let me know. Looking at booking a train ticket Stockholm to Copenhagen… this was very useful, thanks! Thanks a lot for finding it useful and letting me know. Enjoy Sweden and the train ride! Just what we were looking for, well thought and presented nicely! Hard to find useful info like this anywhere else. 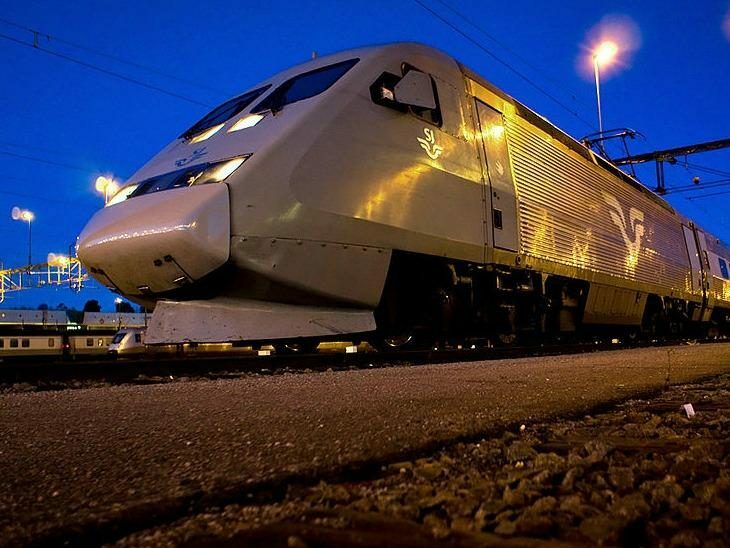 Do you have an opinion on taking a high speed train from Gothenburg to Copenhagen versus just a direct one? I like saving the hour and a fair amount of money but was wondering if there was any downside? Thanks. Thanks for your kind words! :) I think the direct train is an “Öresundståg” which is the commuter train between Copenhagen & Malmö stretched to Gothenburg. You will without a doubt survive on this type of train, but you will lack service on board. Personally, I would go for an SJ High speed train, unless the difference in price is not astronomical. I hope this helps and wish you a great journey to Sweden & Denmark. Very helpful! Thanks (just wish I’d discovered you when I first started researching this trip). You will be fine on the direct train Gothenburg – Copenhagen as well. Just bring drinks and snacks for the trip at the station and you will have a nice ride. I am taking a train from Stockholm to Goteborg and there appear to be 2 train options, SJ and mtr express. Can you recommend which is better? I haven’t traveled with MTR Express but I have only heard good things about them. MTR is the company who operates subways and commuter trains in Stockholm and subway in Hong Kong, so it is decent player in the market. I would choose what ever suits your itinerary the best, whether it is price or timings. Hello, great info! Any concerns about luggage size and storage on first class. My husband and I will both have suitcases and carry ones. Thank you! The general rule is you should only bring as much luggage as you can carry. There are luggage racks for suitcases and overhead shelves for lighter luggage. If you have a suitcase, a handbag and a computer bag you should be fine. Hello, that was some great info. But since the SJ site is only in swedish, and I had to search for tickets elsewhere… is the price for the train from Stockholm to Goteborg the same for the SJ train if I prebook it now and if I buy it at the counter at the station when I’m visiting in September? I am glad you liked my article! SJ pricing is dynamic, which means that it is a question of demand and supply. That usually means that it costs more when you get closer to departure.